Many motorcyclists in Texas love the long, open roads and year-round riding weather. They keep their bikes in good condition and don’t take risks, especially when riding in heavy traffic. However despite every effort to be safe, motorcyclists are still at the mercy of other drivers. When those drivers fail to yield and refuse to give a safe buffer, motorcyclists can end up in an accident and suffer serious injuries. The attorneys at Parker Law Firm encourage all motorcyclists to contact them soon after an accident to get skilled, experienced help. Over half of all fatal motorcycle crashes involve another vehicle. In many of these crashes, the motorcyclist was doing absolutely nothing wrong when he was blindsided by a careless or negligent motorist. It’s important for motorcyclists to know the most common types of collisions with cars, what causes them and how they can be avoided. Pulls out of a side street or parking lot into the path of a motorcycle. Motorcycles are small and often hard to see. Whether the driver failed to see the bike, failed to correctly judge the distance to the bike or just thought he could beat the bike, these crashes are the fault of the driver of the car, not the motorcycle. Goes through an intersection out of turn. Some drivers won’t wait for a motorcycle while at a four-way stop and will cross the intersection out of turn. 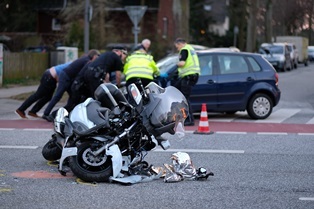 Even though these crashes are often at a low speed and not dangerous for the driver of the car, a motorcyclist could be seriously injured or killed. Changes lanes in front of a motorcycle without allowing enough space. When a driver fails to check his blind spot before changing lanes in front of a motorcycle, the biker may be unable to stop in time to avoid hitting the car. Even though the motorcycle hits the car, the driver is at fault for the accident. Makes a left turn in front of a motorcycle at an intersection. When a car has a green light in the left turn lane at an intersection, he is required to yield to any oncoming traffic. If a motorist fails to see an oncoming motorcycle, he may make the turn in front of the bike, causing the bike to hit him head-on. As this crash can occur at considerable speed, it can prove fatal for the biker. In all of these situations, a biker may be able to avoid the crash by anticipating the driver’s carelessness. Motorcyclists should always assume that drivers do not see them and slow down when they see a car preparing to pull out. At intersections, bikers should make eye contact with a driver before pulling out, even if it is their turn to proceed. Finally motorcyclists should ride with the assumption that cars are not going to give them the space they need. Pulls out onto a busy street without looking for motorcycles. If a motorist is not specifically looking for a motorcycle when pulling into traffic, he could collide with a bike right in front of him. Drivers are programmed to look for other cars and can be blind to smaller vehicles. Making a right-hand turn without checking blind spots. If a driver fails to signal his intention to make a right turn and doesn’t check his blind spot as a motorcycle is passing on the right, the driver could T-bone the biker, causing serious injuries. Failing to yield at an intersection. If a motorcycle is crossing through an intersection and a motorist fails to yield the right-of-way, he could drive into the side of the bike as it passes. These accidents can be fatal to the biker. There is not much a motorcyclist can do to avoid being T-boned by a car, other than making himself as visible as possible. Keeping headlights on at all times, wearing bright, reflective gear and acting predictably are the best ways to avoid being hit. Motorcycles are not often rear-ended by cars, but when they are, it can result in a serious accident. These accidents happen when a driver is distracted and fails to see that a motorcycle has slowed or stopped in front of him. While a car might be big enough to catch a distracted driver’s attention, a motorcycle may not be, and the car could slam into the back of the bike. With no protection other than what he is wearing, a rear-end collision could cause debilitating or fatal injuries to the biker. The motorcycle could be pushed into a larger vehicle in front of him or into oncoming traffic, making the crash even more devastating. If you are a skilled, conscientious biker who has fallen victim to a careless or distracted driver, we are happy to hear your story and take your case if we think we can help. Our fees never exceed your settlement, and we will fight hard to help you keep the money you have been awarded, rather than pay it out to your insurers. Call our Bedford motorcycle accident attorneys today for a free consultation about your motorcycle crash.